Shading paints that wear off gradually over time and do not need to be cleaned off at the end of the season. This range is designed to offer growers an effective, user-friendly solution. Temporary protection from light and heat for different periods of time without having to clean the paint off at the end of the season. Often called On/Off, these paints produce results that are stable over time until removed using the appropriate cleaning product. Combining shading and diffusion solutions, this range gives growers control over when they remove the coating. Not entirely sure which solution fits your needs best? We’ve collected some resources to help you out. Get instant product advice in 5 easy steps. How do our paints influence the sunlight? Quick answers to frequently asked questions. Applied on the various elements of the greenhouse structure, these solutions make it possible to maintain and protect your greenhouses from premature wear and tear. We’re celebrating our 60th anniversary, see how got here. Photosynthetically active radiation, often called PAR, is the spectral range of solar radiation from 400 to 700 nanometers that crops use in the process of photosynthesis. 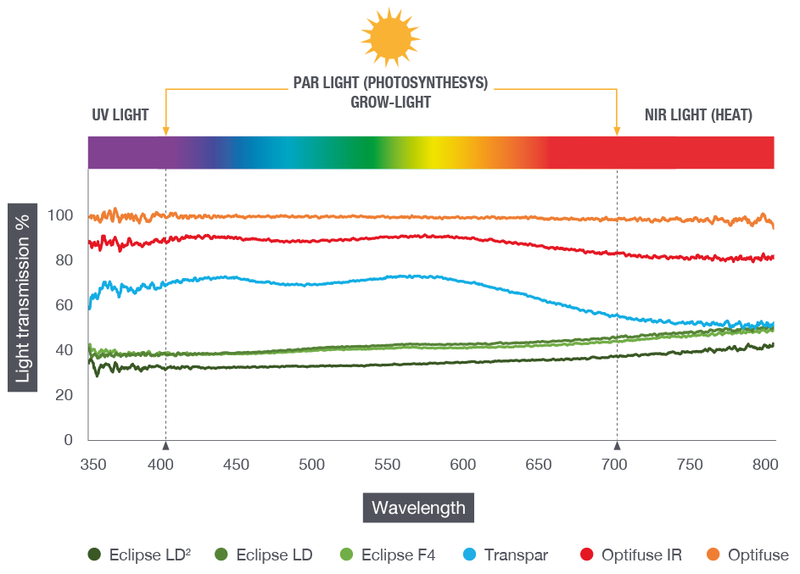 Near-infrared light (NIR) is the spectral range of solar radiation from 700 to 2500 nanometers and is a very effective method of generating warmth in the greenhouse. NIR is not used by crops for photosynthesis. Ultra-violet, which means beyond violet, is the range of solar radiation from 10 to 400 nanometers is present in approximately 10% of the sunlight. UV-light regulates plant growth and could be helpful in preventing fungal diseases. Haze is the percentage of perpendicular incoming light that is deflected at other angles. If a product has a high haze factor, this means that there is little direct light falling onto the subject, and most is spread around it. Haze does not mean less light; it only says something about its scattering behavior. Our paints affect the percentage of light transmission, but also modulate the light spectrum to offer the most appropriate response to different needs.